Big Sky Basketball: How Will Eastern Washington Replace Glen Dean? We are slowly making our way through the departed stars of the Big Sky, and now it is time to take a look at the one who didn't go via graduation - Glen Dean of Eastern Washington. After the firing of Kirk Earlywine and hiring of Jim Hayford, Dean originally said he was going to be sticking around for the Eagles, before changing his mind and departing for Utah, where he will have to sit out a season. On first blush, a Big Sky team (that finished 10-20) losing a 2nd team Big Sky performer as a sophomore sounds like a huge loss, but the good thing for EWU is that they are deep in the backcourt and should have the talent to make up for his departure. Returning, they have 3 guards that got a lot of PT last season and will not be fazed by having bigger roles this year. The best among them may be Jeffrey Forbes, who had the highest ORtg on the team as a sophomore. What made him so effective was his 3-point shooting, as it was at 41% on 134 attempts (compared to 92 2PT attempts). He could stand to improve his assist rate, but he doesn't commit a ton of turnovers and his true shooting % was a cool 58%. Also back are a couple of guys that can put up points in a hurry. One is Cliff Colimon, who averaged 10.4 PPG as a junior, including scoring 27 points in the Eagles Big Sky Tourney game against Weber St. After Dean, he had the highest ARate on the team, but also has a propensity to turn the ball over. There is nothing wrong with his 51.3 EFG%, and if he can combine it with being a little better of a distributor for EWU, he will be a very solid contributor. Quick - name the player on EWU that scored 39 points in a game last season? Bet you didn't say Kevin Winford, who also had a 28 point game. Ait 5'11'', he doesn't pull down many rebounds, and doesn't get a lot of assists (though he has a solid TO rate), but he is a streak shooter than can put up points in a hurry. He took a team high 187 3s last year, making a respectable 35%. If he can push that up even a couple points, he will be extremely dangerous. 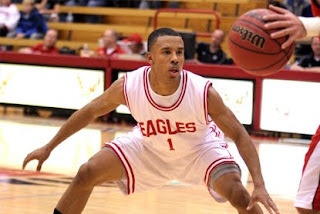 Then there are a couple of newcomes who should have big roles for EWU. One is Collin Chiverton, a JUCO recruit who should immediately be one of the best athletes in the Big Sky. He is a wing player, but will be counted on heavily to put points on the board. He was a top 150 recruit out of high school and looks to be a difference-maker for Jim Hayford. Then there is redshirt Willie Hankins, a guy that EWU fans are very excited about. If he can stay motivated and play consistently, he could be a starter and have a big role in the offense. EWU spread the ball around well last year, and with diverse options in the backcourt such as Hankins, it is easy to envision a similar scenario this year. Eastern Washington was an interesting team stylistically last season as they were one of the smallest teams in the country and yet played at a below-average tempo. It will be interesting to see if Jim Hayford brings more of a running style to Cheney, because even with the loss of Dean, they will be guard-oriented. My gut feeling is that we could see the Eagles finish in the top half of the Big Sky, and get some office space nyc. Willie Hankins is going to be the surprise of the Big Sky just watch. Willie Hankins has a shot at Freshman of the year for EWU.